Many hot and boiling mineralized springs are active near Baransky. Geothermal surveys have been carried out in a zone 2-4 km SW of the volcano, and a geothermal station is being built there. Temperature data from several boreholes show a strong increase in 1989, 4-5 months before the eruption of Ivan Grozny, 13 km SW. Temperatures decreased after the eruption. Gas composition (table 1), temperature, and location of fumaroles in the SW-flank explosion crater remained unchanged in 1990-91. Table 1. Composition of gases from the Baransky area: fumaroles in the SW-flank explosion crater (samples 1-4); the bottom of the Kipyaschaya River drainage (6); geothermal drillholes (7-8). Analyses by U.A. Taran and U.A. Ignatorich. Data courtesy of G. Steinberg. An exploration well into a zone of hot water 4.5 km SW of the summit (in the Kipyaschaya River valley) was drilled in the summer of 1991. Drilling was temporarily halted in early August, but no casing was installed. Two weeks later, a hydrothermal explosion occurred ~50 m upslope, forming a crater >10 m in diameter. A mixture of vapor, water, and a large quantity of rock fragments was erupted for several days, destroying vegetation within 50 m. The explosion was believed to have occurred when hot water moved up the borehole after drilling ceased, and escaped through its uncased walls into a permeable fissured zone near the surface. Information Contacts: G. Steinberg, Yuzhno-Sakhalinsk. The Global Volcanism Program has no Weekly Reports available for Sashiusudake [Baransky]. 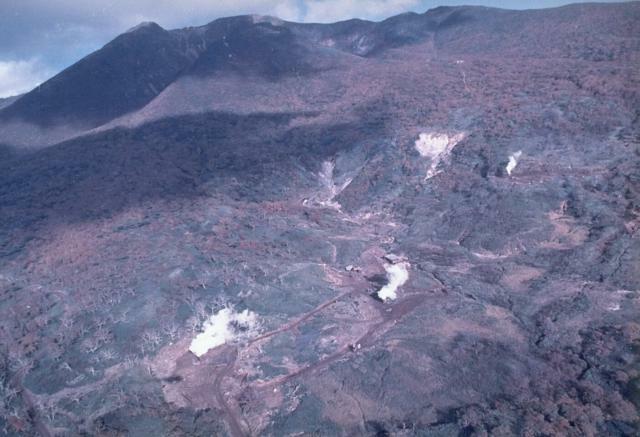 During observations 4-7 October 1987, five fumaroles in an explosion crater on the SW flank were forcefully emitting vapor. Jets rose 3-5 m and had temperatures of 99-107°C. In the summit crater, a 40-m-diameter explosion crater in the lava dome contained a smaller lake than in the past. The lake was <0.2 m deep, the surface was only 10 x 15 m, and the water was cold. Weak vaporization was occurring at two points on the dome (vaporizing temperatures are 40-45°C). No fumaroles were observed but there were many areas of sulfur deposits. During an October visit to the crater, activity remained at previous levels. Fumaroles were concentrated in five groups with gas temperatures ranging from 98 to 108°C. Gas was released under pressure in four of the five groups, to 2-6 m height. 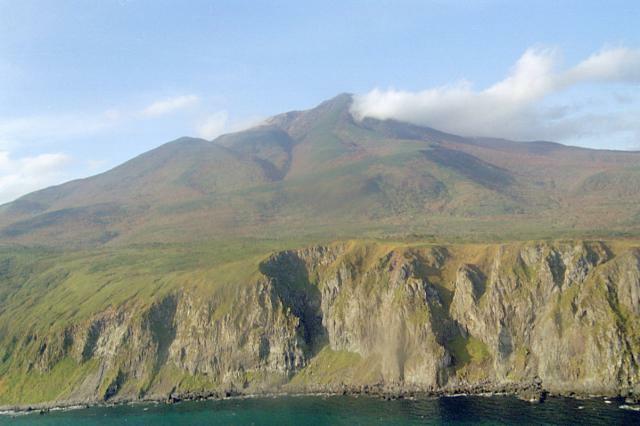 The Sashiusudake (also known as Baransky) volcanic complex along the Pacific coast in the central part of Iturup Island consists of an eroded Pleistocene volcano that is capped by a Holocene stratovolcano. A young summit lava dome is cut by a NW-trending chain of small explosion craters. 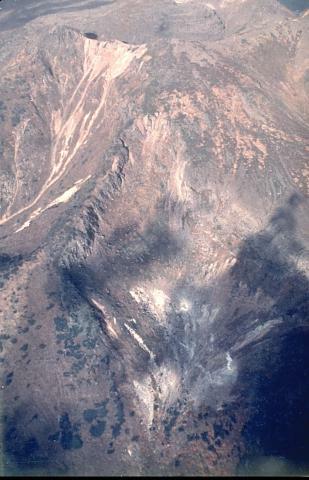 A group of flank cones farther to the NW with a similar NW-SE orientation is partially surrounded by lava flows from the central crater of the andesitic-dacitic volcano. Lava flows from descended 4-5 km SE to reach the Pacific Ocean along a broad front. The only historical eruption occurred in 1951, when local inhabitants reported weak explosive activity at the summit. Strong solfataric activity continues from the summit and several flank craters, and the SW flank geothermal field contains hot springs and geysers. A small hydrothermal explosion took place in 1992 at an exploratory well in the SW-flank geothermal field. Rychagov S N, Stepanov I I, 1994. Hydrothermal system of Baransky volcano, Iturup Island: mercury behavior. Volc Seism, 16: 133-144 (English translation). There is no Deformation History data available for Sashiusudake [Baransky]. There is no Emissions History data available for Sashiusudake [Baransky]. Strong solfataric activity continues at a SW-flank geothermal exploration area, seen here from the west. A small hydrothermal explosion took place at an exploratory well there in 1992. The Baransky volcanic complex consists of an eroded Pleistocene volcano that is capped by a Holocene stratovolcano. A summit lava dome is cut by a NW-trending chain of small explosion craters. The only historical eruption occurred in 1951, when local inhabitants reported weak explosive activity at the summit. Photo by T. Vendelin (courtesy of Genrich Steinberg, Institute for Marine Geology and Geophysics, Yuzhno-Sakhalinsk). Steam rises from fumaroles on a SW-flank crater of Baransky volcano on central Iturup Island. The summit crater (top) is breached to the NNW. A broad, low lava dome, 500-m wide and 40-50 m high occupies the crater, which has fed lava flows that cover wide areas on the northern and western flanks. The only historical eruption at Baransky occurred in 1951, when local inhabitants reported weak explosive activity at the summit. Photo by T. Vendelin (courtesy of Genrich Steinberg (Institute for Marine Geology and Geophysics, Yuzhno-Sakhalinsk). The SE slopes of Baransky volcano tower above steep sea cliffs along the Pacific Ocean coast of Iturup Island. Lava flows from Baransky (also known as Sashiusu-dake) descended 4-5 km SE to reach the Pacific Ocean along a broad front north of the location of this photo. The only historical eruption consisted of weak explosive activity at the summit in 1951. Strong solfataric activity continues from the summit and flank craters, and the SW-flank geothermal field contains hot springs and geysers. Photo by Alexander Rybin, 1999 (Institute of Marine Geology and Geophysics, Yuzhno-Sakhalin). There are no samples for Sashiusudake [Baransky] in the Smithsonian's NMNH Department of Mineral Sciences Rock and Ore collection. Large Eruptions of Sashiusudake [Baransky] Information about large Quaternary eruptions (VEI >= 4) is cataloged in the Large Magnitude Explosive Volcanic Eruptions (LaMEVE) database of the Volcano Global Risk Identification and Analysis Project (VOGRIPA).